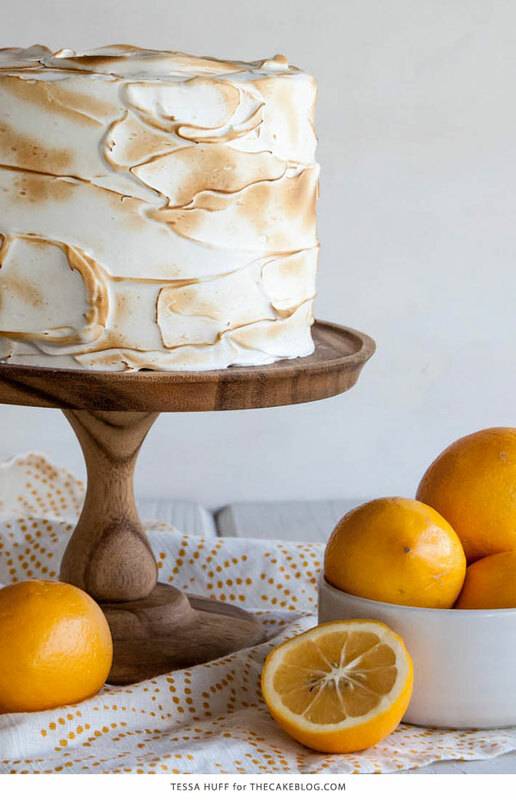 This Lemon Meringue Cake is bright, fresh and sure to impress! 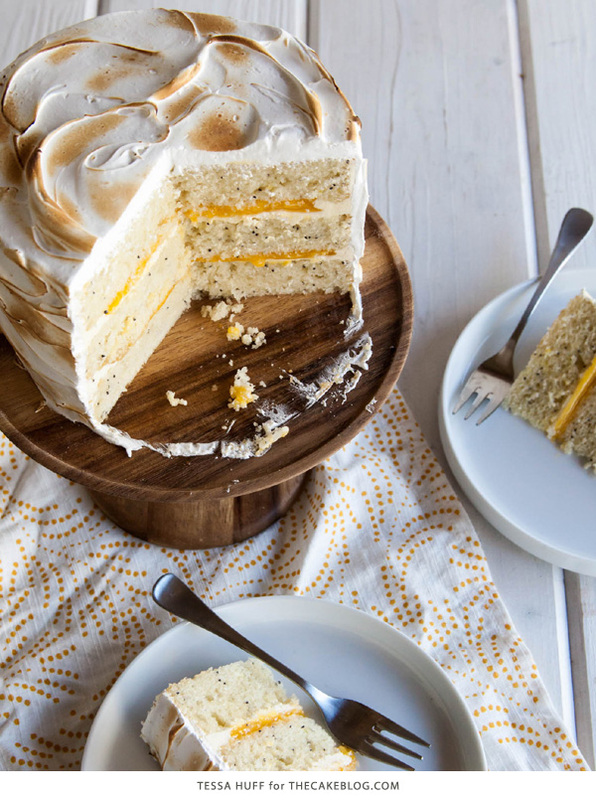 Lemon poppy seed cake with lemon curd and toasted meringue frosting. A new layer cake recipe by our contributor, Tessa Huff. While some of us are enjoying an early spring, others may still be in the middle of one of the worst winters in decades. Either way, we can all find happiness in this sunny cake. Fortunately for everyone, winter citrus are in abundance this time of year, with bright, lively lemons everywhere. 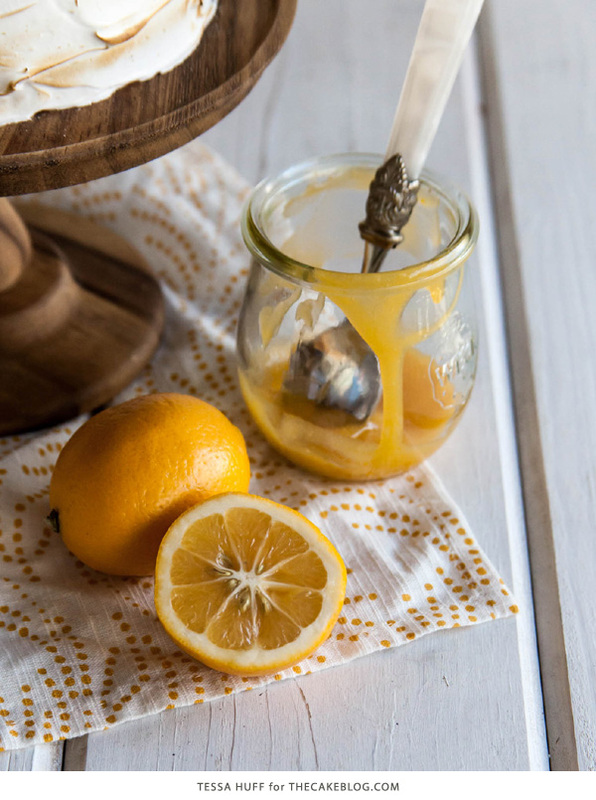 I especially love finding and baking with Meyer Lemons. They tend to be much sweeter and juicier than other types, bringing great, vibrant flavor to delicious, lemony desserts. 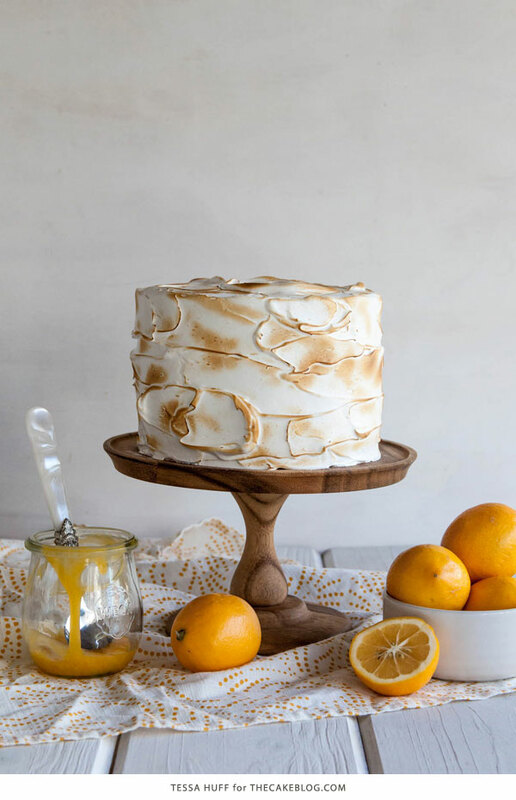 So whether you are aiming to match the spring sunshine or need to beat your still-winter blues, this Lemon Meringue Cake is your answer. I have not-so-fond memories of eating store-bought lemon meringue pie as a kid. The lemon flavor always tasted artificial while the spongy texture of the commercially-made meringue left much to be desired. As a result, I was turned off by lemon desserts for years. Not until I started baking from scratch did I realize how much a bit of fresh lemon could change an entire recipe. 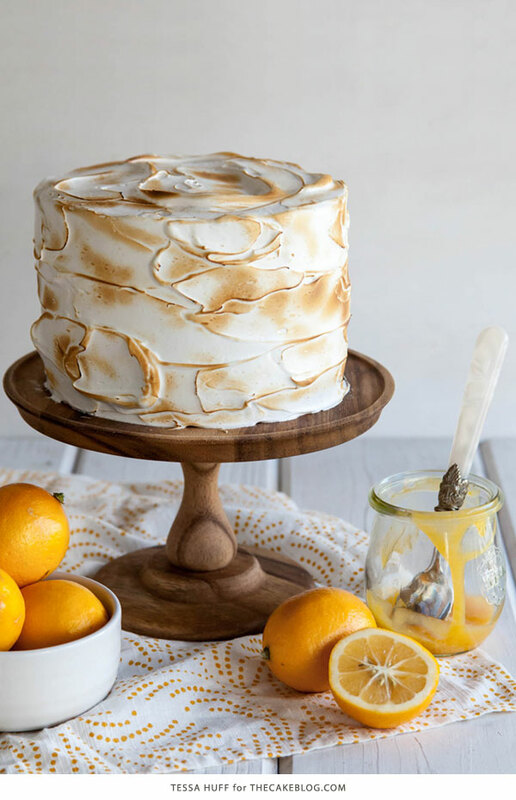 To make up for the years of imitation lemon and and poorly-produced meringue, I decided to recreate the elements of lemon meringue – but in a cake. 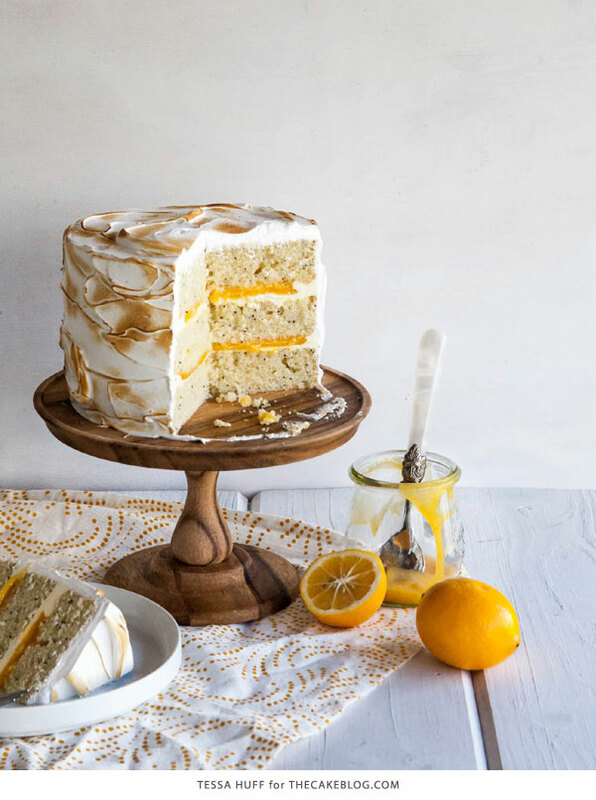 This Lemon Meringue Cake is extremely light, refreshing, and bursting with lemony flavor. Where some butter-based cakes can be dense and velvety, the use of a neutral oil leaves these layers of cake feeling extra tender and airy. The tangy buttermilk, cardamom, and lemon zest in the poppy seed cake add an extra punch of flavor and texture that pair perfectly with the fresh, zesty lemon curd. The cake has been smothered with a light, not-so-sweet meringue icing. For some extra flair and toasty flavor, the meringue has been lightly torched. Preheat oven to 350 degrees. Grease and flour three 6″ round cake pans and set aside. Evenly distribute the batter between the three prepared pans. Bake for about 25-28 minutes, or until a toothpick inserted into the center of the cake comes out clean. Cool on a wire rack for 10-15 minutes before removing the cakes from their pans. Place the juice, zest, yolks, and sugar in a medium saucepan. Stir to combine. While stirring, heat over medium. Continue to stir until mixture begins to thicken, about 6-8 minutes. Curd should coat the back of a spoon when done cooking. Once thickened, remove from the heat and add in the butter. Stir to combine. Strain curd into a heat-safe container. Discard the zest. Cover curd by placing a piece of plastic wrap directly on top of the surface of the curd. Refrigerate until cool and thick. Place the whites and sugar in the bowl of an electric mixer. Whisk to combine. Fill a medium saucepan with a few inches of water and place over medium heat. Place the mixing bowl on top of the saucepan to create a double boiler. Whisking constantly, heat the egg white mixture until the sugar dissolves and it is warm to the touch. Once warm, transfer the bowl back to the mixer. With the whisk attachment, beat the egg whites on high until medium-stiff glossy peaks. Add in the salt and vanilla and mix until combined. Use immediately. Use plain vanilla buttercream to create a dam to hold in the lemon curd filling when assembling, if desired. If you want a higher lemon curd to cake ratio, plan to double the lemon curd recipe for extra filling. Use an off-set spatula to create a rustic finish with the meringue icing. Use a kitchen torch to toast the meringue icing. Hold flame about 6-8 inches away from the surface of the cake and do not keep the flame in the same place for longer than a couple seconds. Oh my, you are making my mouth water over this cake. Please tell me about cardamom. What kind of flavor is it? What does it taste like? Will the cake still taste good without it? Such a beautiful cake! The lightly toasted meringue on the outside is very pretty! I also love the poppy throughout the cake. Stunning! Will the meringue frosting keep once the cake is frosted or does cake have to be eaten the same day? Thanks! Gorgeous cake! The cake looks great, but in the picture it looks like you have sour oranges rather than lemons, but recipe is for lemons. Where does the vibrant orange come from? To Payam: They are Meyer Lemons. They have smooth skin and not as sour as regular lemons. They are a cross between a lemon and a mandarin orange. Meyer lemons are the Best! Cross between = The Meyer Lemon Trees was originally bred using a regular lemon tree and a mandarin orange tree. Thus the Meyer Lemon tree. Meyer lemons are not available year round, usually only in the early spring. Meyer Lemons are available year-round. The better grocery chain, The Fresh Market, has them twelve months of the year. Many specialty and boutique groceries do now. Made the recipe and the batter overflowed and ran everywhere. The batter was extremely liquidey. This cake looks so yummy. I can’t wait to make it. 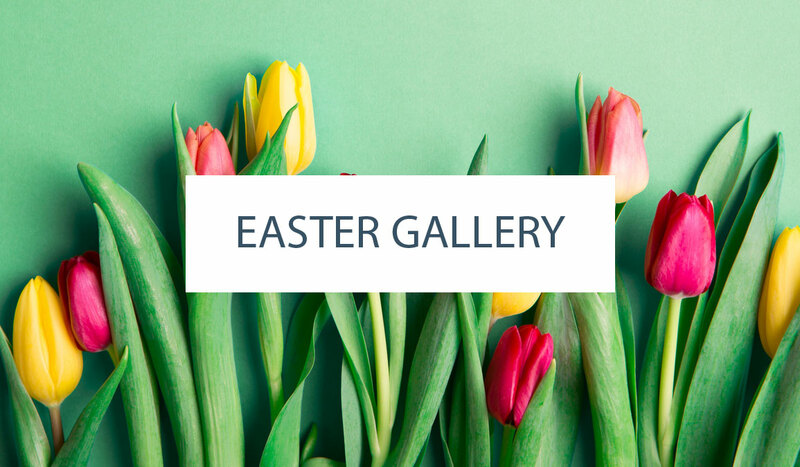 What size or weight are your eggs? Here in South Africa we have L, Extra Large and Jumbo. Which one should I use? What an amazing looking cake! I will definitely be trying this one! This cake looks so yummy and very nice and different looks. Made this for a family birthday last weekend and it was absolutely delicious. And so impressive looking! Thank you for a great recipe! I can’t wait to make this cake for my hubby’s birthday! Lemon is his favorite! One question though – why the boiling water? I have added it to chocolate cakes before, but I can’t figure out why it is added to this cake. Hi Tessa, this looks so beautiful – I have to make it for a friend who loves lemon. I have a question: I will have to make the cake the night before. Do you think the frosting will hold up overnight in the fridge? Should I wait to toast the frosting until morning? Thank you! Just made the cake part and the layers are maybe 1/4″ thick, is that normal? The photo looks like your layers were A LOT thicker. ……..any suggestions on why that may be? Just made this cake. The layers came out very thin, edges had no rise. Was for a special occasion so i had to start over. Second bake i doubled the recipe and instead of greasing and flouring the pans i greased them and then lined them with baking paper, results were much better. For anyone aiming to have this turn out like the picture then definitely double the mixture, there is nowhere near enough for three 8inch pans. I don’t know if flouring the pans stops the egdes from rising, just a guess, but the paper worked for me. I forgot to add that as I doubled the mixture I baked it at 150 degrees instead of 180, I cooked it for 50 – 60 minutes, until a skewer insterted into the middle came out clean. Cake turned out perfect and was amazing in taste, and I don’t usually like anything lemon-flavored. I did notice that on the second day, the meringue was somewhat grainy. I didn’t refrigerate it after it was finished, so wondering if that’s why? It was silky smooth the entire first day. Thanks. Did you crumb coat the cake in the vanilla buttercream prior to adding the meringue icing or did you apply it directly to the cake? Just making this recipe now, and I noticed it doesn’t state to add the 3/4 cup of boiling water anywhere. Does it combine with the other liquids? The batter seems wet enough without it, but if its meant to be there, I want to make sure I add it. What does buttermilk do for cakes that other milks do not? I don’t have buttermilk in the house unless I intentionally go out and buy it for a recipe. I often decide to bake on the spur of the moment and there is no buttermilk just hanging around my fridge. Curious. It all comes down to acidity and how it affects the final cake. You can see a comparison of different dairy options in one of our baking science articles here. 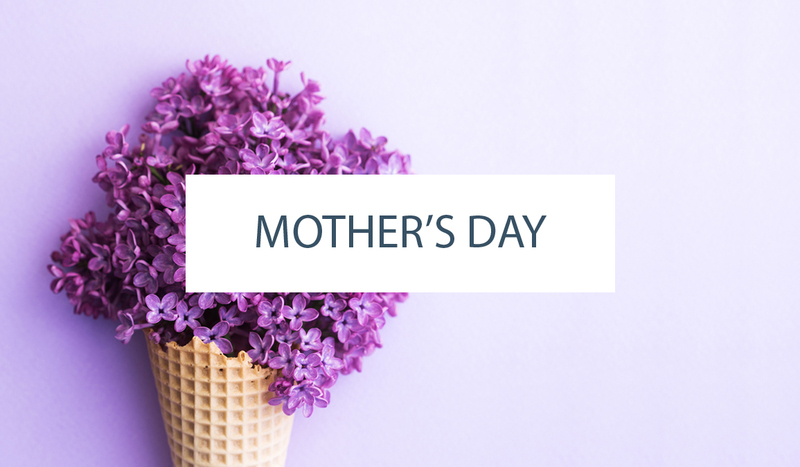 If needed, you can also substitute 1 tablespoon of white vinegar or lemon juice plus enough milk to measure 1 cup to replace 1 cup of buttermilk. Stir, then let stand for 5 minutes. Hi Carrie can I make this cake the day before serving? Can I torch the meringue the day before and keep cake in fridge until serving the next day? Can we get this recipe converted to grams? Or what’s 1 cup equivalent to in AU?